Every Halloween since we’ve been married, my husband and I have dressed up together. From things as simple as white T-shirts that said “Sick” and “Tired” before we had kids, to Mary Poppins, Bert and the dancing penguins. This year’s “Super Mario extraordinaire” involved both of us and our 3 children (4 yr old boy/girl twins, and our 1 yr old boy). Halloween is just about the only thing that we think of and plan ahead for, so the idea came to us many months before the event. which is good because I never could have gotten these costumes done without plenty of time. Princess Peach’s dress was sewn from a dress pattern from the fabric store, fairly straight forward-just a little extra fluff in the sleeves and tutu. Toad’s hat I formed (again with felt) onto a toddler hat that already had a chin strap to make sure it stayed on, and his vest was pretty simple (although my husband told me it was purple when in reality it is supposed to be BLUE! … I don’t think anyone noticed). Bowser posed quite a challenge. I scoured pictures online of several costumes and pulled what I liked and discarded what I didn’t like. I began with the shell and spikes (I figured those were the simplest shapes to form-I had no prior experience with 3d shapes in sewing). I used a pillow for the main bulk of it, then attached the ring around it and the spikes. In doing this I discovered the most amazing stuffing material PLASTIC SHOPPING BAGS! (…shshshsh don’t tell anyone my secret). It turned out to be perfect for giving the spikes stiffness while remaining lightweight… and super cheap! This made me much more confident in undertaking the most difficult part-Bowser’s face. I saw online a suggestion to use a baseball cap so that it would already fit my husband’s head and build onto it to make a headdress/mask. We didn’t want to cover his face (church rules, and overall comfort) so we decided to have his face in Bowser’s mouth. I completely constructed the face initially just out of shopping bags constantly looking at pictures of Bowser online. Once I was finished I wasn’t sure how to cover it all, until I realized I could take it back apart one piece at a time, and cover each piece with fabric before sewing it back together. Just the head itself took me about 2 hours a day (during kids nap time) for 8 days to complete. It turned out amazing, and my husband was super stoked! The rest wasn’t so daunting. I made the pants from a pajama pant pattern (which is just about the only thing I sew, other than Halloween costumes of course), made about 10 sizes too big. The feet I used the same concept as the baseball hat and formed them onto my husband’s old work boots. I used little Velcro pads to connect the pants to the shoes. For the torso we bought a bright yellow T-shirt (took some searching to find one that matched the felt for the pants) and I sewed the ribbed belly onto it. I made the spiked collar and arm bands out of black felt, along with gray spikes all around (we considered duct tape, but decided against it, and I’m glad we did). I made the neck collar fasten at the back with Velcro as well. I used the same felt from the pants to make sleeves for the forearms. The final challenge was how to attach the giant spiked pillow/shell to the rest of my husband, and have it be secure enough to walk around and not fall off. We decided to use wide suspenders so that the shell wouldn’t be tugging on the shirt and choking my husband. It ended up working fantastic. I sewed some hooks from the fabric store into the suspenders and corresponding ones into the shell. I had to cut some small holes in the back of the shirt so that the hooks could connect while the suspenders were worn out of sight under the shirt. We had to tighten the suspenders to compensate for the weight of the shell, but we hooked the front clasps to the costume pants AND my husband’s basketball shorts underneath, for added anchoring. We decided against gloves for the hands and functionality and convenience as well. Throw in a couple more spikes and a shopping bag stuffed tail, and I was finally finished. 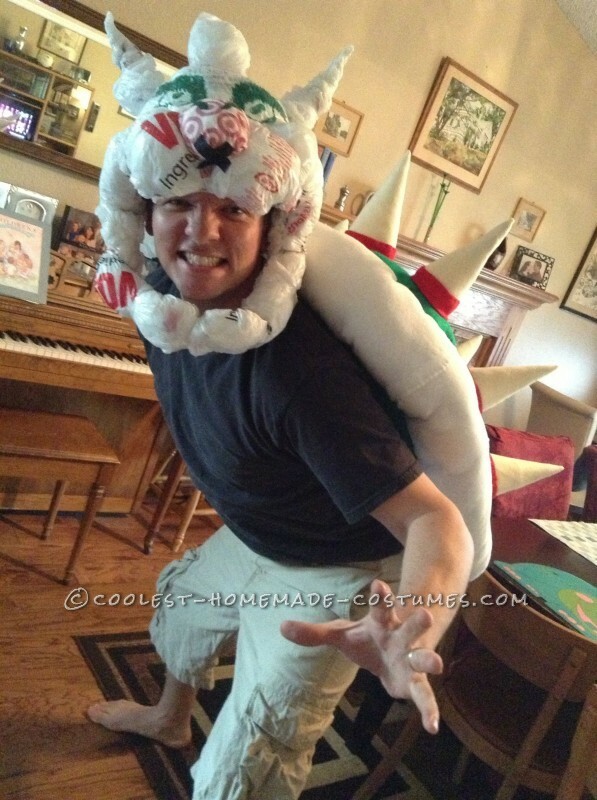 We put it all together and Voila’ Bowser Power! We blew people away at the Halloween party, winning a top prize for group costumes. 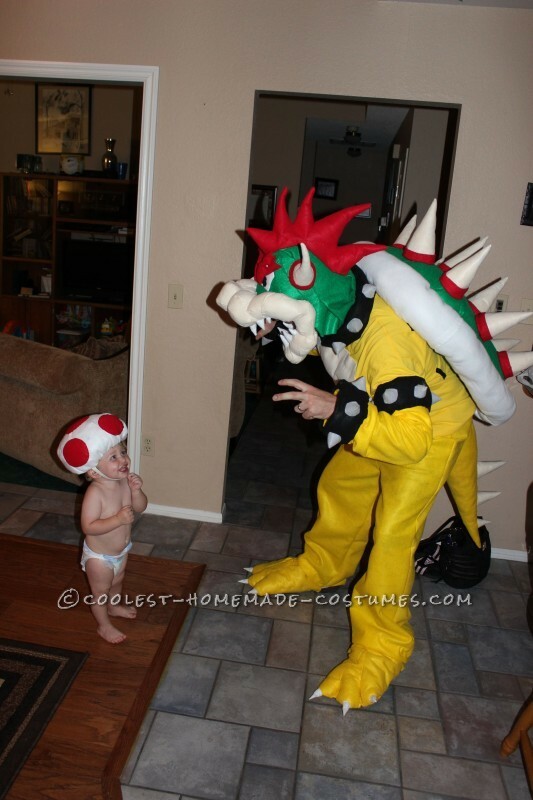 The other kids at the party were infatuated with Bowser as well. If there were a prize for most harassed villain, he would have won it for sure. We had a great time, and hope to continue dressing together for a long long time (until our kids completely refuse). We are already gearing up for next year. What a marvelous idea! 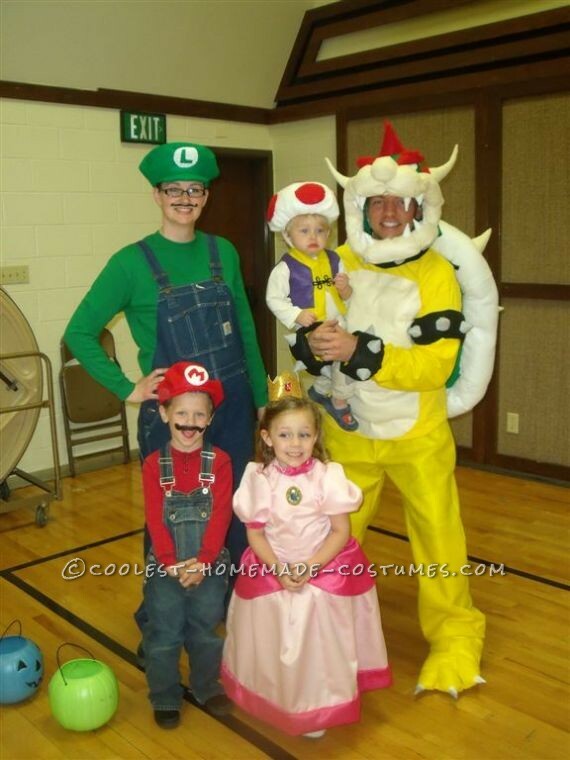 I wouldn’t dare try to compete against your family in a costume contest. Mrs. Kelly, you have proven yourself a worthy sewer of the upmost respect!